The average bidweek price of natural gas in New England for December settled at $14.52 per million British thermal units (MMBtu), well above prices in other U.S. regions, according to the IntercontinentalExchange monthly index. The bidweek price, shown in the chart above, sets in a price for natural gas over the entire month at agreed upon volumes. In the past 20 years, natural gas prices in the Northeast have only reached this level on two occasions. In 2005, hurricanes Katrina and Rita led to extremely high prices at the benchmark Henry Hub in Louisiana, and the financial crisis in 2008 led to high natural gas prices throughout the United States. This December is the first time that the bidweek price at the Algonquin hub, which serves Boston, has reached this level. What is natural gas bidweek? Market participants in the natural gas industry buy much of their physical natural gas, or gas they will consume, for the upcoming month as part of a process called bidweek. During the last three to five business days at the end of each month, natural gas buyers and sellers execute transactions for physical natural gas for the upcoming month. Trading exchanges such as ICE or price-index publishers such as SNL Energy, NGI, Argus, or Platts report average settlement prices for the next month according to varying criteria. Month-ahead settlement prices apply to each day for the following month and are applied to volumes the counterparties agreed to during the bidweek settlement period. Although growth in domestic natural gas production has driven down natural gas prices throughout most of the United States in recent years, constraints on the Algonquin Gas Transmission pipeline system heading into New England have contributed to short-term spikes in spot prices for natural gas in Boston during winter months. These recent trends, in turn, have been reflected in prices for the December 2013 Algonquin Citygate futures contract. the announcement, on November 14, of scheduled maintenance at Canada's Deep Panuke offshore unit, a source of supply to meet New England's peak gas demand. Flows into the northeastern United States fell below year-ago levels on the Maritimes and Northeast Pipeline (M&N), which transports Canadian production from Deep Panuke and Sable Island offshore production fields to Canada and the United States. M&N also transports regasified LNG cargos offloaded from the Canaport terminal in St. John, New Brunswick in Canada to the United States. Meanwhile, flows increased on the Iroquois Pipeline and the Portland Natural Gas Transmission System (PNGTS) pipeline, both of which interconnect with pipelines owned by TransCanada that also serve consumers in Ontario and Quebec, where demand increased significantly at the same time that Deep Panuke went offline. New England pipeline constraints limit the delivery of more natural gas to consumers in the market, making natural gas and power prices more volatile during periods of high demand—mostly in the winter. Bidweek natural gas transactions let buyers and sellers lock in prices for each day in the prompt-month, rather than purchasing daily prices in the physical spot market. For example, last December the average bidweek price for natural gas in Boston was a little over $10/MMBtu, while the average spot price during the month was about $5.80/MMBtu for all trading days, with prices at times going over $10/MMBtu. However, while the spot price in any region changes (often drastically) from one day to the next, bidweek trading provides price certainty for natural gas delivered throughout an upcoming month. For many years, the price of natural gas has had a strong influence on the price of electric power in New England. Moreover, natural gas now accounts for more than half of the generation in New England, straining natural gas deliverability into the region, which can cause increases in natural gas prices. Last winter, the spot price for natural gas at Algonquin Citygate peaked at $34/MMBtu, contributing to on-peak power prices that spiked to over $260 per megawatthour (MWh). 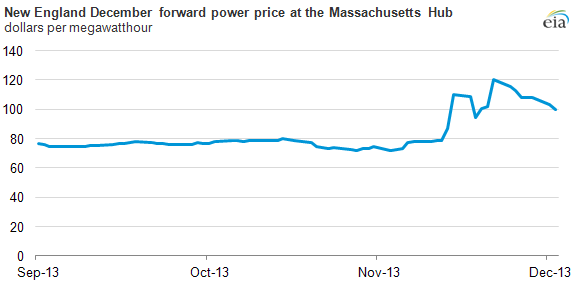 Typically, spot prices for wholesale, on-peak power range between $30 and $40/MWh in New England. 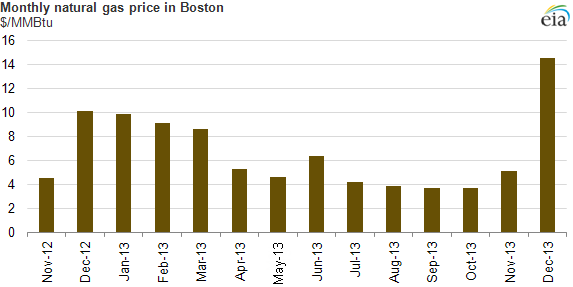 Near-record natural gas prices at the Algonquin trading point established during the December 2013 bidweek contributed to forward, wholesale power prices at the Massachusetts Hub for December 2013 of more than $100/MWh.